There’s a time and a place for urban luxury, for penthouse-suite opulence. But faced with the choice many of us would gladly opt for a far-flung desert-island disappearing act. To that end there’s hardly anywhere as far-flung as the Seychelles, the tiny Indian Ocean archipelago. And if you had to pick just one of its hundred-plus islands you could do a whole lot worse than Frégate. The hotel proper consists of sixteen hillside villas, each one angled to provide panoramic ocean views while maintaining the purity of island seclusion. Indigenous mahogany and teak, along with cream-colored marble floors, provide the framework for tropical breezes to flow through the open living spaces. Terraces feature daybeds, jacuzzis and private infinity pools — luxury means paying no mind to whether you’re indoors or out. In this segment of the market, private butler service is a standard amenity, and the presidential villa comes with a personal chef and an army of staff. It’s about more than just the impossibly luxe villas, of course. The whole point is that the entire island — from the seven dazzling white-sand beaches to the lush greenery of the interior — is both an ecosystem and a resort, and it’s impossible to define one without the other. Guests dine in their villas, at the yacht club, at the plantation house restaurant, on the beach, or even up in the branches of a banyan tree. The island’s own hydroponics house provides homegrown fruit and vegetables, and offers curious guests a firsthand look at the sustainable cultivation of the ingredients that make up Fregate Island’s seasonal cuisine. The old shipwreck fantasy has come a long way. 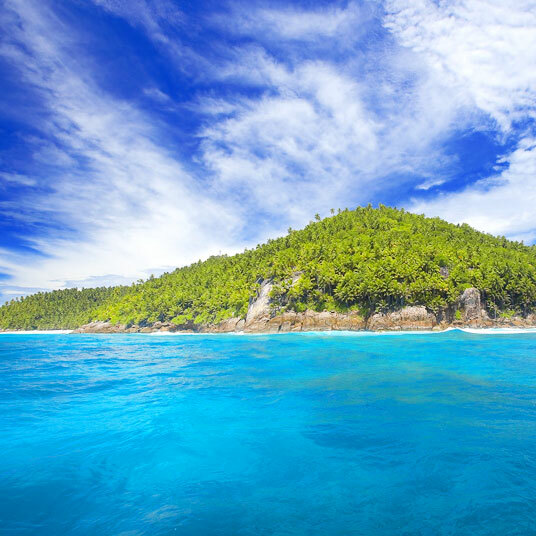 How to get there: Frégate Island is a twenty-minute flight from the Seychelles International Airport (SEZ) in Mahé. Please contact customerservice@tablethotels.com to arrange airport transfers.